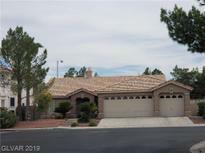 Below you can view all the homes for sale in the Silverado Hills subdivision located in Las Vegas Nevada. Listings in Silverado Hills are updated daily from data we receive from the Las Vegas multiple listing service. To learn more about any of these homes or to receive custom notifications when a new property is listed for sale in Silverado Hills, give us a call at 702-323-5939. Be one of the first to view this gem! MLS#2077477. Platinum R.E. Professionals. *** Wise Floorplan With Open Kitchen, Fireplace, Vaulted Ceilings *** Upgrades Galore - New White Shaker Cabinets And Quartz Counters, New Paint, New Wood Look Tile, Designers Fireplace, New Light Fixtures And Many More *** New Exterior Paint *** Paradise Backyard With Crispy Clean Pool Is Ready For Summers! Fully Landscaped *** Welcome Home! MLS#2078181. Realty ONE Group, Inc.
3 Car Garage, RV Parking/Gate, Covered Patio, Balcony, Fresh Int/Ext Paint, New Tile Flooring & Carpet, CF's in all Bedrooms & so much more! MLS#2075073. Realty Executives Southern. Space for RV parking. Custom cabinets in garage. MLS#2076356. Prominent Realty Group LLC. Beautiful Two Story In The Heart Of Silverado Ranch*well Cared For And Ready For Immediate Move-in*fromal Front Living Room*separate Dining Area*huge Living Room With 3 Way Fireplace*granite Kitchen Counters*tile Flooring*retreat Off Master Bedroom*roman Tub And Spacious Walk In Closet In Master Bath*all Appliances Included*oversized Lot*covered Patio*popular Location, At Walking Distance To All Of The Shopping And Amenities* MLS#2066546. Alajajian Properties. Inviting two story beauty in the heart of Silverado Ranch*Very spacious five bedrooms layout with one bedroom and a full bath downstairs*Tri-level floor plan with front living room with cozy fireplace, formal dining room & sunken family room*Eat-in kitchen & huge upstairs loft*Roman tub and additional fireplace in master bath*Oversized and easy care back yard*Very popular location,just minutes to all the shopping & amenities*Great potential* MLS#2053274. Alajajian Properties.